Gamblogger: Brazil Likely to Win World Cup Opener, but Can They Go All the Way? Brazil Likely to Win World Cup Opener, but Can They Go All the Way? World Cup expectations of the Brazilian team are very high. They'll most likely win their opening match against Croatia but you have to wonder if they can handle the pressure and go all the way to winning the Cup. Brazil has won five World Cup titles -- more than any other country. They'll also have home-advantage this time around so it could happen! 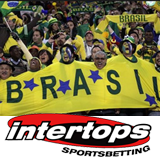 Right now, Intertops Sportsbook bookmakers strongly favor the home team (-303) to beat Croatia (+900) in the World Cup opening match on Thursday, but they aren’t entirely convinced the Selecao can live up to the enormous pressure to win the title. I do too! After all, no European team has ever won the title in South America. Plus, European teams have suffered some serious injuries lately, including reigning World Footballer of the Year Cristiano Ronaldo (Portugal) and Spain’s prolific goalscorer Diego Costa. Another title hopeful France has already lost the services of Bayern Munich star Franck Ribery with a back injury. Intertops Sportsbook will take bets on every World Cup match in Brazil. In addition to outright winner, it has posted dozens of bets on every game including Half Time Results, Correct Final Score and Time of First Goal. Intertops offers a huge range of live betting options on every game and also has a special in-play offer for customers: Risk-Free Live Bets during five World Cup games. If the first live bet placed on these games isn’t a winner, it will be refunded (up to $100). The opening match will be the first to feature Risk-Free Live Bets. World Cup $200 Free Bet Customers placing at least $2000 on World Cup bets will receive a $200 Free Bet in time for the final on July 13th. Daily Cash Prizes Everyone wagering on the World Cup tournament will be eligible to win a no-strings-attached $500 prize on every matchday. You can enter the $100,000 World Cup Bracket Contest until the start of the first match on Thursday. If you can predict all 64 winners you'll win $100,000!